Medical care is vital for our life and health, but the waste generated from medical activities represents a real problem of living nature and human world. Improper management of waste generated in health care facilities causes a direct health impact on the community, the health care workers and on the environment Every day, relatively large amount of potentially infectious and hazardous waste are generated in the health care hospitals and facilities around the world. 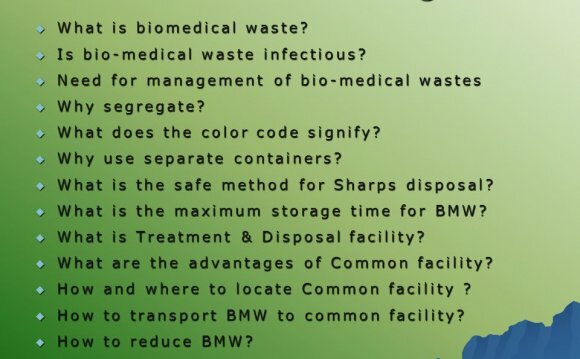 Indiscriminate disposal of BMW or hospital waste and exposure to such waste possess serious threat to environment and to human health that requires specific treatment and management prior to its final disposal. The present review article deals with the basic issues as definition, categories, problems relating to biomedical waste and procedure of handling and disposal method of Biomedical Waste Management. It also intends to create awareness amongst the personnel involved in health care unit.